The patient is a 43 year old woman with a clinical history of gross hematuria and urinary tract stones, who underwent a cystoscopy to further evaluate the cause of her symptoms. Upon cystoscopy, the patient was noted to have a large mass at the posterior bladder wall that resembled a hemangioma. Several bladder biopsies were taken. On histologic examination, benign urothelium was seen. Located deep in the tissue were areas of acute and chronic inflammation, granulation tissue formation, and benign glands surrounded by stroma. The stroma was morphologically identical to endometrial stroma. On review of medical records, the patient did note that the hematuria coincided with her menstrual cycle. 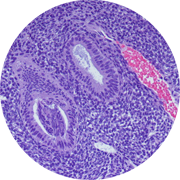 The clinical and histologic picture is consistent with endometriosis. Endometriosis of the bladder is rare, but occurs more commonly with a history of prior pelvic surgery. Patients may present with urinary tract symptoms such as pain and hematuria. On radiographic examination, endometriosis may resemble a primary bladder neoplasm.